NEWARK, New Jersey -- A fire in a building near the tracks in Newark disrupted New Jersey Transit and Amtrak service Saturday. 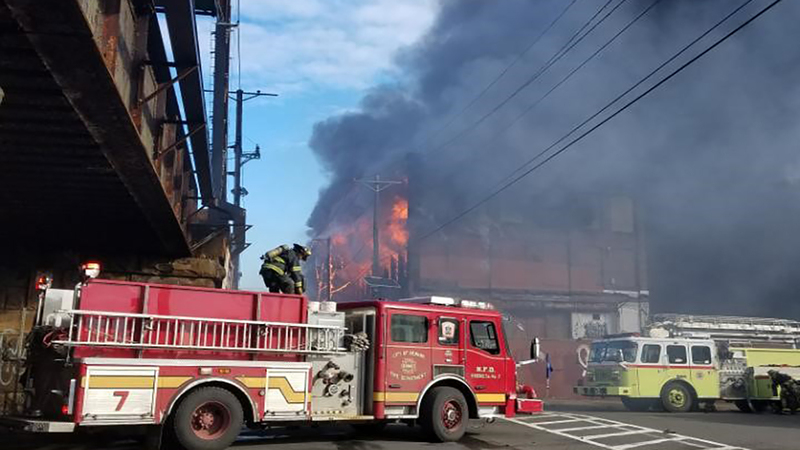 The two-alarm fire broke out shortly after 10 a.m. in a vacant building at Garden Street and New Jersey Railroad Avenue. Northeast Corridor and North Jersey Coast Line train service was suspended in both directions between Newark International Airport and Penn Station New York due to the fire department activity. Raritan Valley Line train service was also suspended between Cranford and Newark Penn Station. Service later resumed with delays of up to 60 minutes. NJ Transit bus and private carriers cross honored NJT rail tickets and passes. The fire spurred Amtrak to hold its trains in Newark in both directions, but service later resumed. About 60 Newark firefighters responded to the scene. Two firefighters were hospitalized with minor injuries.